Springtime in the States meant garden planning. After enduring the winters of the Midwest, the ground was ready for new plantings—and we were ready for visits to the local nurseries and greenhouses for that perfect spark of annual cover. And the greenhouses and nurseries were ready for us to spend our well-earned dollars on these purchases. Every year, my wife, Jackie, and I would spend over $200 to replenish our garden, but we felt it was worth the beauty we achieved. However, now that we live in the tropical climate of Costa Rica’s Central Valley, we no longer must wait through the snow and cold to have our floral beauty. And we also do not have to shell out a small fortune to add to our gardens and flower pots. 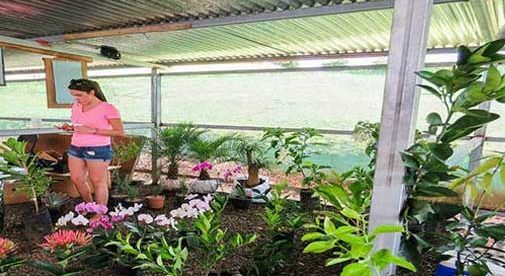 The canton of La Garita, a short half-hour drive from our new hometown Sarchi, is renowned for its nurseries, or viveros, and greenhouses, offering everything from Staghorn ferns to orchids. One of the more vibrant flowers that grows abundantly throughout the Central Valley is the Bougainvillea, which grows on hillsides, in house gardens, and in patio pots. While we had a large growth on the side of our house, we wanted a starter plant for a pot on our balcony and a four-foot plant only cost roughly $4 at the large vivero. Hydrangeas are also very popular in garden plantings, with flowers growing to be the size of a basketball, and these can be purchased for about $2 per plant. We have spent afternoons at the various viveros, leaving with the back of our SUV loaded, and rarely do we spend more than $15 for the load. We have also found that the towns around our area have smaller nurseries with excellent prices, but not nearly the variety and selection of the larger ones in La Garita. A store in Naranjo, just about five minutes from our house, is a perfect spot for us to browse for coverage plants like marigolds and moss roses. We also purchase our fertilizer and potting soil from this local store, and 15 pounds of organic potting soil is a mere $2. Our best find at this local store was a gardenia plant for about $5, which has been constantly blooming since we purchased it a year ago. Growing plants in the tropics is not without its perils, though. Insects and fungus can take their toll on them, with leaf cutter ants able to defoliate a small rose bush in a day. Powdering and spraying the foliage with insecticides regularly keeps the pests in check, and monthly feeding with a high-nitrogen fertilizer keeps the leaves healthy enough to combat the fungi that can creep in. For a couple who loves to be surrounded by flowers and plants, I think we have found our ideal place for year-round beauty.